Set in a splendid position right on the edge of the Costa Smeralda, Hotel of the Resort Cala di Falco lies just a short distance from Cannigione beach and offers splendid views over the Gulf to its guests. 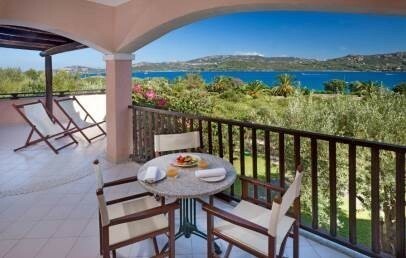 Similarly to other hotels of the Delphina collection, the position of this resort is very good to explore the surroundings of the Sardinia’s north-eastern coast. 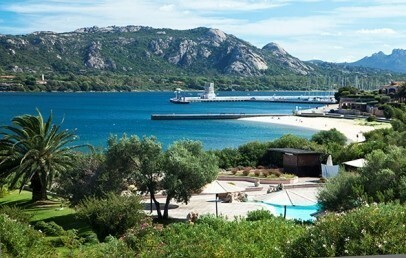 A welcoming 4-star Superior Hotel is set within the Resort Cala di Falco, which also includes the Residence and le Ville. 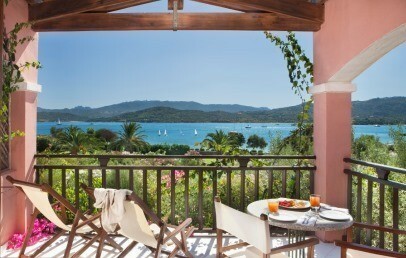 The hotel reflects the architectural style of the Costa Smeralda and overlooks the sea with its wide stone-flagged terraces, pleasing relaxation areas and lush gardens. Hotel guests can enjoy a large central pool with furnished solarium and lifeguard service, and a kids’ pool in a controlled area of the Mini Club. 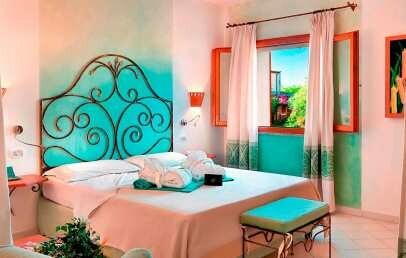 Welcoming and well lit, the hotel rooms are furnished in Mediterranean style and with fine soft furnishings, all the work of local artisans. All rooms are within easy reach of the hotel’s main services, yet remain silent and completely relaxing. Connecting rooms upon request and subject to availability. The hotel is just a short distance from the free beach of Cannigione, a large stretch of golden sand equipped with sun umbrellas and deckchairs, reserved for the hotel’s guests (subject to availability, free of charge). Just a few km further on and you can explore the most beautiful beaches in northern Sardinia. If you are looking for a hotel to spend a vacation with the family, the Resort Cala di Falco will meet all your needs, especially as to the entertainment for toddlers and kids: a Mini Club (3 – 11), an equipped playground, a dedicated pool. The Mini Club is free of charge, open from May 19st to September 13th, from 9 am to 1 pm and from 3 pm to 6.30 pm; 7 days a week. Open for lunch and dinner (buffet), the restaurant La Poiana looks on to the pool and offers a rich buffet breakfast selection and a wide range of delicious Mediterranean and Sardinian specialities. Stylish and romantic, La Terrazza Restaurant has a splendid view over the gulf and is the ideal setting for candle-lit dinners. Opening is at the Management’s discretion. Booking is required and a 12 € per person supplement is payable. For lunch, guests can have pasta, pizza and snacks at the pool bar. The hotel offers a half-board formula, with breakfast and dinner included in the cost of your stay. The opening of the restaurants and bars is at the discretion of the Management. The cost of your stay includes use of the vehicle parking area (no surveillance), access to communal areas and use of the pool, tennis court and beach volley court. Wi-Fi connection is available free of charge at Reception, in the pool areas and at the Hotel bar. At Reception, guests can book transfers, excursions or a boat trip on the Delphina Express, or arrange for hire of an inflatable or a boat. 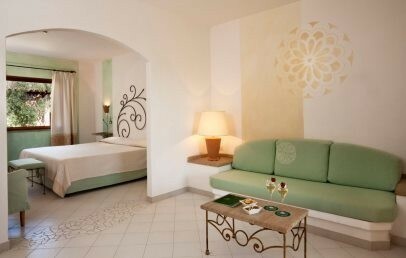 The Classic rooms are furnished in a simple yet modern Mediterranean style. They have a double bed for two adults, bathroom with shower, veranda or terrace equipped with coffee table and chairs. The style of décor is reminiscent of traditional Sardinian handcrafts with wrought iron furniture and embroidered fabrics. 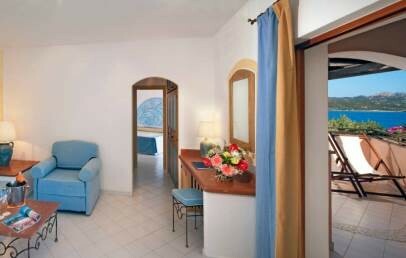 The rooms are set in a more central area close to the resort’s main facilities. 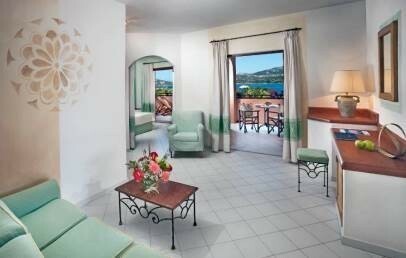 The Classic sea view rooms are furnished in a simple yet modern Mediterranean style. They have a double bed for two adults, bathroom with shower, veranda or terrace equipped with coffee table and chairs. The style of décor is reminiscent of traditional Sardinian handcrafts with wrought iron furniture and embroidered fabrics. The rooms are set in a more central area close to the resort’s main facilities. 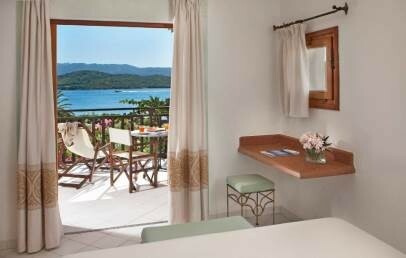 All rooms have a fine view over the sea. Spacious accommodation with a bedroom with double bed (single beds available on request) and open plan living room with armchair bed or wall sofa bed. Bathroom with shower and large veranda equipped with coffee table and chairs. The accommodation is designed for two adults with the option of sleeping a third guest aged up to the 13 years and a child aged up to 1 year in a cot. Spacious accommodation with a bedroom with double bed (single beds available on request) and open plan living room with armchair bed or wall sofa bed. Bathroom with shower and large veranda equipped with coffee table and chairs. 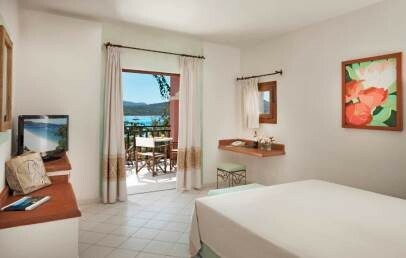 All rooms have a fine view over the sea. 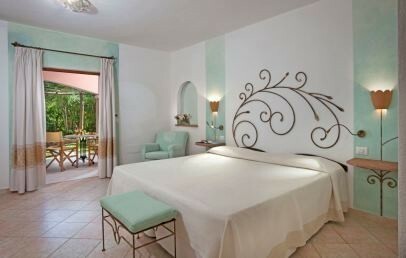 The Suites have a bedroom with double bed and a separate bright and spacious day area with access to the veranda. The day area has two armchair or built-in sofa beds able to sleep a third and fourth guest aged up to 13 years. The suites all have a bathroom with shower and a veranda or terrace provided with coffee table and chairs. 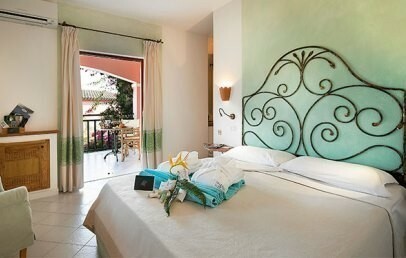 The Suites have a bedroom with double bed and a separate bright and spacious day area with access to the veranda. The day area has two armchair or built-in sofa beds able to sleep a third and fourth guest aged up to 13 years. The suites all have a bathroom with shower and a veranda or terrace provided with coffee table and chairs and have a fine view over the sea. 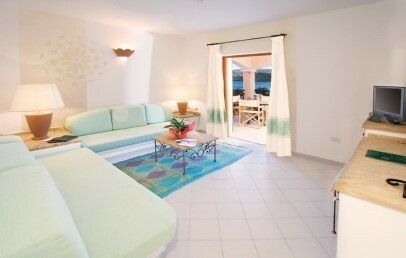 The Senior Suites are the perfect accommodation for those with children looking for a holiday in complete freedom. The bedroom with its double bed is separate from the living room in order to offer guests the maximum in privacy. A separate bedroom is available for two children or two friends with two single beds. In addition the living room has a double sofa bed or built-in sofa beds and there is a bathroom with shower. The Senior Suite has a veranda or terrace provided with coffee table and chairs. 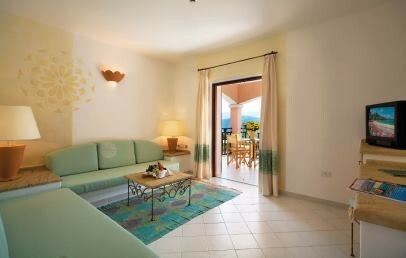 The Senior Suites are the perfect accommodation for those with children looking for a holiday in complete freedom. The bedroom with its double bed is separate from the living room in order to offer guests the maximum in privacy. A separate bedroom is available for two children or two friends with two single beds. In addition the living room has a double sofa bed or built-in sofa beds and there is a bathroom with shower. The Senior Suite has a veranda or terrace provided with coffee table and chairs. 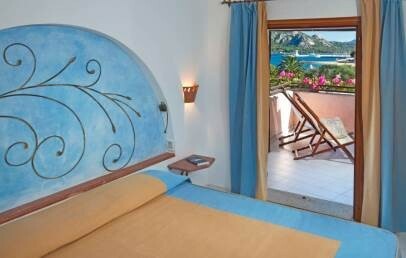 All rooms have a fine view over the sea.